There is something incredibly inspirational about people who overcome great odds, and, in the process, make the world better place for the rest of us. Most of these individuals didn’t just do great things, they also said great things. Their words will be inspiration for generations to come. 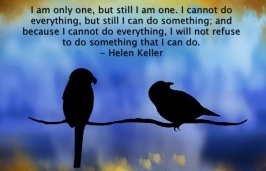 As a young girl, I became fascinated and inspired with the story of Helen Keller. I always figured if she could do great things, maybe I could too. And even though she couldn’t hear or see, she could still express herself beautifully. Her story always makes me smile. Posted on November 5, 2013, in Family, My life, perspective and tagged 365 reasons to smile, Helen Keller, Heroes, inspiration, life, musings, perspective, smiles. Bookmark the permalink. 71 Comments. Like you, I have always found her story to be incredibly inspirational!One of the reasons I became a speech/language pathologist was a desire to work with deaf students. Thank you for these posts! I remember going to see the Miracle Worker on stage. I had broken my finger that day and it was throbbing, but I refused to go to the doctor because I didn’t want to miss the play! What irony! To have a broken finger while you watch fingerspelling…. !